SEAT Young Driver, which offers driving lessons to youngsters from 11 to 16 years old, has just taken delivery of a brand new fleet of SEAT Ibiza Ecomotives. Featuring fuel-saving technology such as an engine stop/start system and brake energy recovery, the Ibiza Ecomotive is among the lowest-polluting new cars on the road with CO2 emissions of just 92g/km. The scheme opened at Birmingham’s NEC in October 2009 and has since provided over 20,000 lessons at venues across the UK including London, Bristol, Sheffield, Bluewater, Glasgow and Newcastle. Young Driver’s eighth venue opens in Southampton in June. “Responsible parents are interested in the safety of their youngsters on the road and young people in particular are very aware of environmental concerns. The Ibiza Ecomotive is a great opportunity for SEAT Young Driver to demonstrate the cars of the future to tomorrow’s motorists,” says Steve Robertson, Head of Marketing for SEAT UK. According to SEAT Young Driver, research from Sweden shows that accidents are reduced by 40 per cent through providing under 17s with driver training. With one in five UK youngsters crashing within six months of passing their test, so the scheme set out to establish the first nationwide network of sites to offer driving experience to those from 11 to 16. 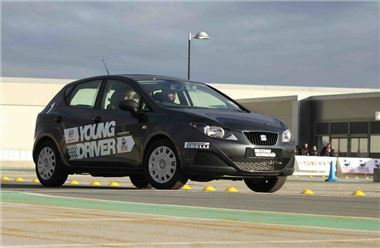 Throughout May, SEAT Young Driver has reduced the prices of 30-minute and 60-minute lessons by 10% at all UK sites. A 30-minute lesson now costs just £27.